$5.00 FACE VALUE 90% SILVER U.S. 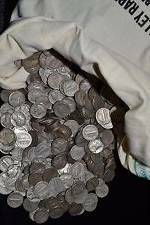 COINS ROOSEVELT DIMES 50 COINS .900 FINE ! $5.00 FACE VALUE (1 ROLLS - 50 COINS) 90% SILVER U.S. COINS ROOSEVELT DIMES MINTED 1946 - 1964 .900 FINE SILVER LOT ! INVEST NOW - SILVER IS JUST CRAZY ! (Photo is stock, THIS LOT IS ROOSEVELT DIMES ONLY Circulated VG - BU quality!